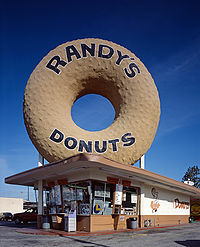 Randy's Donuts is a landmark building in Inglewood, California near Los Angles International Airport, in a style of novelty architecture that was popular throughout Southern California from the mid-1920s to the mid-1930s. The building was designed by Henry J. Goodwin. It is a 24 hour drive-in and owned by brothers Ron & Larry Weintraub. While you may not have noticed Randy's consciously you you most certainly have seen it at some time before. The building is featured in the films Earth Girls Are Easy, Mars Attacks!, The Golden Child, Into the Night, Stripped to Kill, Problem Child 2, Breathless, Californication,California Girls, 2012, Iron Man 2, "Get Shorty", Volcano, Crocodile Dundee in Los Angeles, Escape from Petropolis, and Love Letters. It can be seen briefly with other world-famous monuments in the Futurama episode "When Aliens Attack." It has also been featured in the music videos for Randy Newman's "I Love LA" and The Prodigy's "Wind It Up". As well as in the music video for Red Hot Chili Peppers' "Californication." Very similar buildings with giant donuts, under different names, are featured in the video games Midnight Club: Los Angeles, Need for Speed: Most Wanted, City of Heroes, and Grand Theft Auto: San Andreas as well as in "Marge vs. the Monorail", an episode of The Simpsons. The iconic structure was shown on the History Channel series Life After People, showing what would happen to the building without human repair. The building's famous doughnut can be spotted in the scene changes of the Nickelodeon sitcom Victorious. In the episode "Pier Pressure" of Arrested Development, in a sequence showing Buster's medical trial for THC, medical marijuana, a picture is shown of Buster standing next to Randy's Donuts on the roof attempting to eat his way through it. In the film Iron Man 2, the protagonist Tony Stark is seen eating donuts while reclining inside the doughnut sign. In the film 2012, the doughnut sign can be seen rolling through the streets during an earthquake. This iconic building is often used like an in-joke for Los Angeles. Not only that their donuts are very good.